If you need to raise money for your new business or project then crowdfunding could be the answer. The campaign not only encourages people to launch a crowdfunding campaign through their website but will also see 10 Crowdfunding Masterclasses taking place in cities around the UK throughout June and July. Dates of the tour are; 23rd June at TechHub Manchester, 24th June at Fazeley Studios in Birmingham, 26th June at TechHub Swansea, 27th June at The Engine Shed in Bristol, 30th June at Sync Norwich, 1st July in Nottingham (venue TBC), 3rd July in Sheffield (venue TBC), 7th July in Leeds (venue TBC), 8th July at Campus North in Newcastle and 10th July at TechCube in Edinburgh. “There is very little crowdfunding outside London and that cannot be for lack of great talent, creative ideas and good businesses. We think it has to be down to a lack of awareness of crowdfunding and more importantly how to successfully crowdfund which is why our Masterclasses will show people how to run a successful campaign”. 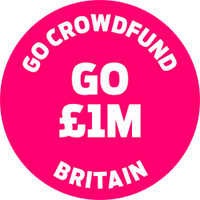 Find out more at http://GoCrowdfundBritain.indiegogo.com and share it on Twitter by including the #GoBritain1M hashtag.